This vacation Villa is located in the prestigious, gated, private golf community of Querencia. Querencia Boarders Palmilla Resort. Newly Added Beach club is a short walk or short golf cart ride. 4 private restaurants and club house with an additional 3 private pools with pool side service. Pictures do not do this 4 Bedroom/ 6 Bath, Querencia Villa justice. 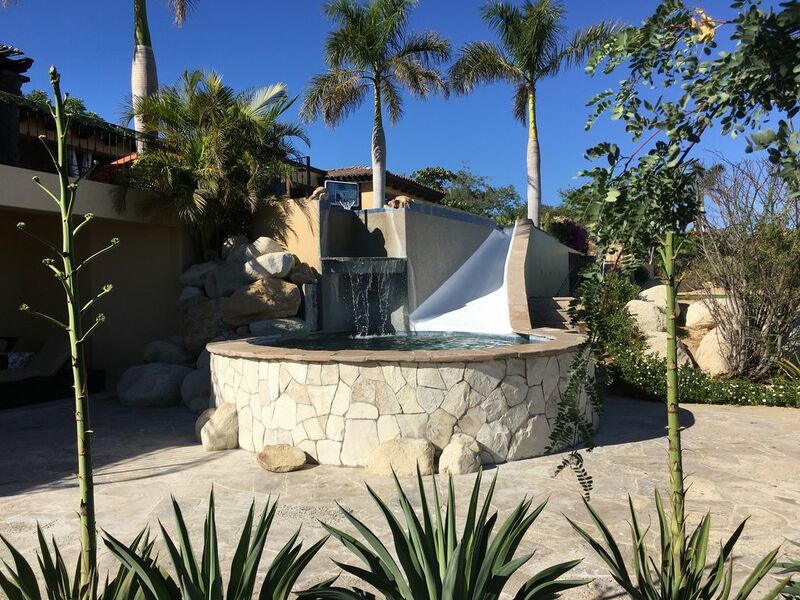 Enjoy gorgeous ocean views from every single room in this beautiful Mediterrean-style home which has 5800 square feet of vaulted ceilings and wrap around decking Other special features include 2 private pools with cascading waterfall over a cave,with a slide going from one pool to the next. The outdoor barbeque area offers large dining area, with an evening fire pit and black pebble water feature. Accommodating up to 14 adults, this villa makes for a very affordable choice. Watch your next moon-rise from your own private vacation home. Some Resort amenities are included. This is a Non smoking villa. Bedding includes 3 King Beds, 2 Queen and 2 Daybeds with a rec room to include an additional kitchen. Just a five minute drive away and you can walk the streets of Historical Downtown San Jose after dining at one of the many fine outdoor dining establishments. Our weather here in Baja guarantees you with a perfect climate year round. Centrally located to shopping, restaurants and the beach. safe neighborhood with very high end ammenities. Golf cart down to the beach. Gourmet Kitchen with very large Kitchen Bar. Some Querencia club house amenities. Spa amenities, 3 private restaurants, 3 pools, teen center and kids pool and kids club.